The eyes, nose and mouth of Down by the Sea Sailor monkey are lovingly embroidered. Measuring 26 cm, he is made of cuddly soft plush for baby's soft skin. The jolly red and white striped trousers with cute embroidered applications can be taken off and put back on. The stitched on cap and the paws in light blue and white stripes make a pretty contrast to the brown fur. 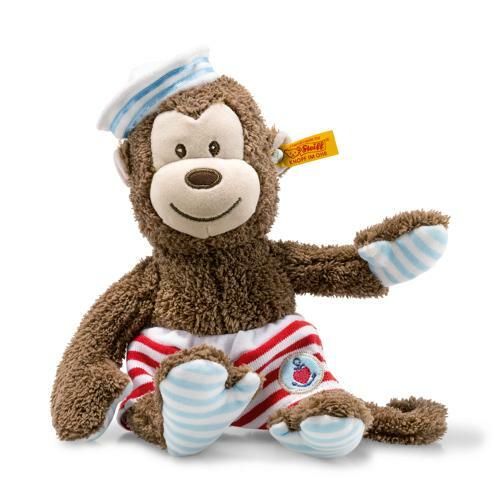 Sailor monkey can sit or lean beautifully thanks to the sewn-in bean bags in his paws and tail.